ONE OF THE GREAT CULTURAL INNOVATIONS IN RECENT YEARS IN SYDNEY HAS BEEN THE ESTABLISHMENT OF PARRAMASALA, A FESTIVAL OF SOUTH ASIAN CULTURE LOCATED IN PARRAMATTA IN SYDNEY'S WEST, FEATURING TRADITIONAL AND CONTEMPORARY MUSIC, DANCE, FILM AND THEATRE AND HYBRIDS OF THESE. FOOD AND RITUAL HAVE ALSO PLAYED A MARKED ROLE IN THE FESTIVAL'S GENERATION OF A SENSE OF OCCASION. Parramasala is aimed not just at the South Asian population of the Western Sydney region—for whom it has become a significant event—but at a broad audience curious to engage with the art and cuisine of South Asia—the rich heritage of their suburban neighbours. Nor do the programmed works emanate only from India, Pakistan, Bangladesh and Sri Lanka; they also come from wherever the South Asian diaspora has established itself around the world, including Australia. I spoke with Rolfe about the components of his 2012 Parramasala program, commencing with a cluster of plays with overlapping themes and concerns. One of the directors of the UK's Tamasha Theatre Company, Kristine Landon-Smith has recently been appointed to NIDA as a lecturer in acting. How did you come in contact with her company? I’ve seen some of their work in the past in England and they registered as one of an interesting bunch of theatre companies that were quite distinctive. I talked to Kristine years ago when she visited Sydney soon after Tamasha was set up. Strangely, the first piece they ever made was developed in Wollongong. I always remember it. It ended up being titled Strictly Dandia—Dandia is a Gujarati dance thing. Kristine is an Australian—she's lived in England for 25 years or so—and she made the show with input from the Gujarati community which is the biggest Indian community in and around Wollongong. That piece which, I guess in those days had a connection to the Strictly Ballroom phenomenon, proved to be quite a success in England. It’s a big-scale, popular piece of theatre—not West End, but who knows, at some point it could well have made it into that scene. It toured regionally in England and it’s still in Tamasha’s repertoire. We reconnected a couple of years ago when I started to do Parramasala. And Kristine and I talked about doing something else—a verbatim piece called The Trouble with Asian Men. It's a small play and we wanted to find a nice venue for it. We’re turning the Jubilee Hall, the ancillary hall in Parramatta Town Hall, into a 100-seater. We’ll have The Trouble with Asian Men and Ansuya Nathan's Long Live the King showing there back to back through the festival. They’re small works but really potent. The Trouble with Asian Men is very funny but it’s also got a lot of content, it’s not just poking fun at tradition. Is it about traditional attitudes and contemporary masculinity? Absolutely. It’s light and enjoyable, accessible. I wanted this year to have theatre again. Last year we had Curious Works [communities telling their own stories in inventive formats. EDS, see article], a very different experience. I wanted to bring theatre back in as a way of showing what you can do in a festival, the sorts of things that can work in short runs. Is The Trouble with Asian Men focused on Asian masculinity in the UK? There are two key people in it from the original cast coming from England and then there’s a third local person who joins as a guest for each performance. We’ve done a lot of research in and around Parramatta. (Actor-writer) Drew Fairley got involved and he and (Sri Lankan-born actor) Monroe Reimers did a whole lot of interviews under Kristine’s direction. So it’s been re-situated in an Australian context (combining) the English content along with some terrific local references. Long Live the King is by Ansuya Nathan who I see is a NIDA graduate. She is a superb actor. She’s written and worked on it and it’s a piece that she completed with Guy Masterton who is one of the regulars in the Edinburgh Fringe. He’s an entrepreneurial director and has a whole string of productions, mostly English—but this is a very distinctly Australian piece. It’s done well in a bunch of contexts and it deserves putting on and it fits well with Trouble with Asian Men. It’s about an Indian family who migrate and arrive in Adelaide on the day that Elvis dies. It’s a sort of parody I suppose but based on some autobiographical detail. They happen to be huge Elvis fans. So there’s this apparent contradiction of a traditional looking Indian family having that kind of obsession and what results from it. Again, it’s a very humorous piece but potent and it shows things about cultural identity or how it can be misunderstood. It's about the juxtaposition between an Australian perception of what Indian culture is and what it’s really like, particularly if you go to India now. I remember, the last time I was in India, in the middle of Rajasthan with this host who looked after me, taking me to his home for dinner with his family. A beautiful dinner was cooked and on this massive wide screen TV we watched Indian Idol. And this guy, Kuldeep Kothari, who has become quite a good friend runs a fantastic foundation, which is about restoring Rajasthani cultures and promoting them to the world. But on this night he was having a great time with his kids. There are those sorts of humanising things in Long Live the King. 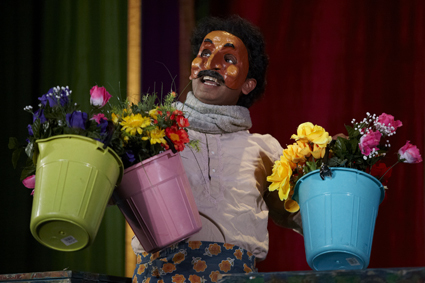 Ansuya Nathan is a standout solo performer, playing all the parts. You also have Krishnan's Dairy by the Indian Ink theatre company from New Zealand, who have been here before. Yes, they came in the first year of Parramasala with the premiere of a new play they’d just completed called The Guru of Chai. They’re a really good theatre company, hugely consistent. They’ve stuck to their guns over the years in not being enticed into other worlds but concentrating on a terrific form of storytelling. And they’re masterful at that. They work and work on their scripts to get them into superb shape. A lot of it revolves around the co-founder Jacob Rajan, whose heritage is Keralan but that’s a couple of generations ago. Excuse me, Jacob, if I misrepresent you, but my understanding in talking to him is that he doesn’t feel a huge connection with that identity but he’s beginning to rediscover it, I think, as people tend to do. Nitin Sawney was very similar—brought up in England, looking Indian and people expecting him to be a tabla player or something. He had no experience of India really until his 20s. So there is that sense of rediscovery that Jacob’s now getting into as well. 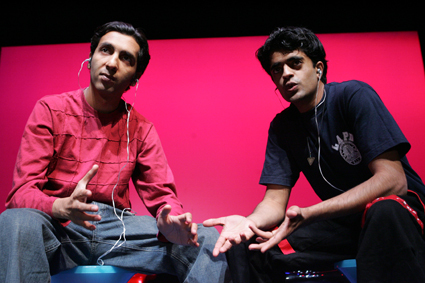 Krishnan’s Dairy is Indian Ink's first ever play. It was made many years ago and it’s a piece that’s been seen in Sydney—in Penrith I think, for like a week and that’s it. I like this company a lot and last time we presented them they sold out. There’s a great rapport with their audience. The Sydney Indians were amazed and had a fantastic time at Guru of Chai, which is a beautiful, original piece about a kind of semi-mystic who lives on a railway station in Bangalore—a chai-seller who is full of philosophy and stories. Jacob has a great capacity to be 20 different characters within an hour, flipping back and forth. It’s traditional but I love that—when you see something where form is not the issue, it’s how he does it. I read that the play juxtaposes a dairy with the Taj Mahal. A dairy is a New Zealand term for a milk bar. The basis of the play is Indian migration into New Zealand—two people who start up a dairy business and are on their way to prosperity. What I like is that within the theatre program we've got three different forms and styles, really good quality, simple. If you’re going to do theatre in a festival in Parramatta, you’ve got to keep it simple. I’m not talking 'simplistic' by any means, but simple in terms of production. There are only so many venues and you can’t afford four-day set-ups—it doesn’t work. You’ve got to take care and pay attention in making it all happen. This is your last Parramasala. What is its relationship with the community? Has the festival achieved some of the aims you hoped? on Indian culture was one possible tactic to help bring a community a little more together. But that wasn’t the overriding reason behind it. Parramasala is set up as a festival reflecting on South-Asian arts, not just Indian because there are other communities developing out there—Sri Lankan, Bangladeshi and Pakastani. But there are lots of common themes. From my perspective it was seen as a way to do something unique—there isn’t anything quite like it in Australia. If you’re going to set up something like this and you want people to come, don’t just serve up what they can already get elsewhere. But it was never conceived as a community-based festival, you know, ‘by the community for the community.’ I think there were people who had their feathers ruffled by that approach, that it was going to be arts-specific and it was not going to just include people out in Western Sydney who felt it was about them. But by and large, there are a lot of people who feel warmly towards it. That was my take on what to do—to actually make something that was rigorous at looking at the global influence of South-Asian arts and cultures wherever they might have impact. They can be in England, in Germany, in the US. Over time, we’ve had lots of artists and productions that have come from all around the world to the festival. I think that should continue. There’s a sense for me and, I hope, for South-Asian people in Western Sydney that it's a really powerful thing, that cultures from their homeland have had impact all over the world. You also have a film program, curated by Ravi Kambhoj, Is it well attended? Yes. We did it for the first time last year and I think it will continue. There was a lot of pressure to do Bollywood movies, and we are screening one titled Sholay, a 1970s Bollywood blockbuster. We’re doing that outdoor one night. It’ll be great fun, a good night out. But the film program is made up of contemporary films from South-Asian filmmakers with one exception, which is a piece called Sunshine & Shade, a new documentary made in Sydney by a fantastic young filmmaker Ani Tiwary. She’s lived in America and made films there. She’s worked in the Bollywood industry in Mumbai. She’s a filmmaker-producer and she’s made this great documentary, which she’s been working on for three years. It’s about the trials and difficulties—and some good things—experienced by Indian students in Australia. That’s our premiere on the first night. It’s a great little piece, not all doom and gloom. It’s character driven and it follows the history of two students in particular, what they went through and where they are now. It’s a beaut piece! I’ve always wanted a non-South-Asian audience to experience absolutely beautiful examples of classical work—at least one or two in a festival. So you can promote those to people who have not experienced them before. And I think that’s a really good thing to do. A festival like this can attract lots of people who wouldn’t ordinarily get involved in seeing Indian or South-Asian work, classical work particularly. But if you put it in the right context, I think you can promote it successfully. In India, Hari Prasad Chaurasia is a household name. He’s as well known or better known than Ravi Shankar. He is of the highest level, a Pandit, the master of his form. He’s got 50-60 year's experience as a performer. He worked with the Beatles, all the stuff that Ravi Shankar did. He’s a master of the bansuri, the classical Indian flute. We’re bringing him and his ensemble here and I think it will be one of those experiences. It’s full of wonderful, beautiful music. To do that in every festival, to have one or two examples of that kind of work, is critical. We have a big Pakistani qawwali group, Asif Ali Khan and a nine-person ensemble from Lahore in Pakistan. They’ll do one free outdoor performance. To see not just small versions of qawwali but the full-on performance with the wonderful vocals and the music from those guys is gonna blow people away. Everyone knows the late Nusrat Fata Ali Khan from the world music circuit. Asif Ali Khan is his replacement in many ways. He learned with him. He’s up there as a contemporary qawwali master. 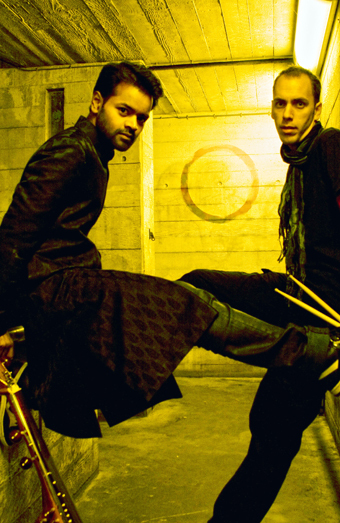 Then there is crossover music, from Soumik Datta, an amazing sarod player. Nitin Sawney pointed to him as a person who should be seen. It’s contemporary Indian music, and he’s a graduate of the Royal College of London. He’s stunning and the percussionist with him, Bernard Schimpelsberger, is also unbelievably good. 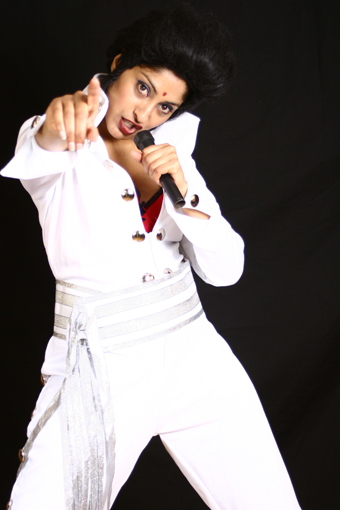 Susheela Raman is a mega musician, but not that well known here. She was brought up in Western Sydney. and is another amazingly good performer, with a powerful voice and her band is superb. She went to high school in Strathfield. Her parents were immigrants to Australia but she moved on to Europe as soon as she got out of school, I think. She’s lived and worked there and has developed this whole career. So after three years of Parramasala, are you happy with how it’s gone? It’s been a good thing to do. I’ve enjoyed it. It’s been bloody hard work. I was asked to do this when I left the Opera House, to set up a festival in Parramatta. I was asked to develop the concept and then to make it work for the first three years. So I’ve had a go and I feel really good to pass it on to someone [yet to be named. Eds]. Is there anything about the Parramasala program we've left out? Good food. Amazing food. And a licensed bar. The food this year is going to be stunning. All carefully selected—no bain maries full of old curries!